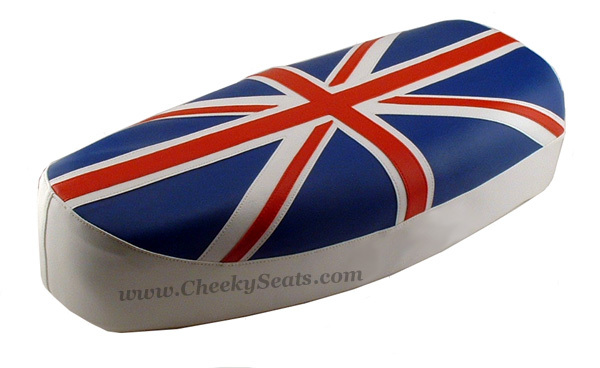 The Union Jack is the most challenging seat cover we make. It is a hand cut and tailored, fully sewn, made to order seat cover, not a printed pattern. No shortcuts are taken in the making of our iconic flag of Great Britain. 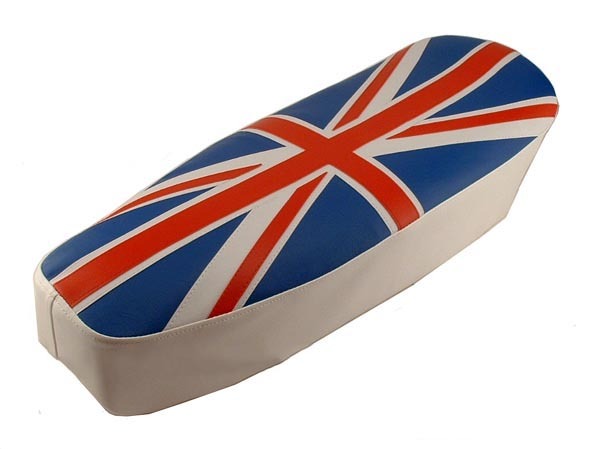 This is our traditional British Flag layout, with the flag only on the top of the seat, and the sides in white. We also have a full wrap style. This seat cover is waterproof, and UV stabilized (will not fade.) We have crafted this for years of serious use, in any kind of weather conditions. No hardware, trim or badges are included with our seat covers, you will have to use those from your original seat. Our seat covers are designed to work if your original seat and foam are solid, and in good shape. If you require a more structured or reinforced cover, please let us know. Our seat covers are designed to go right over your original seat. This is a great way to personalize your scooter while keeping it all original, and protecting the seat you have. Remove the seat cover whenever you like!